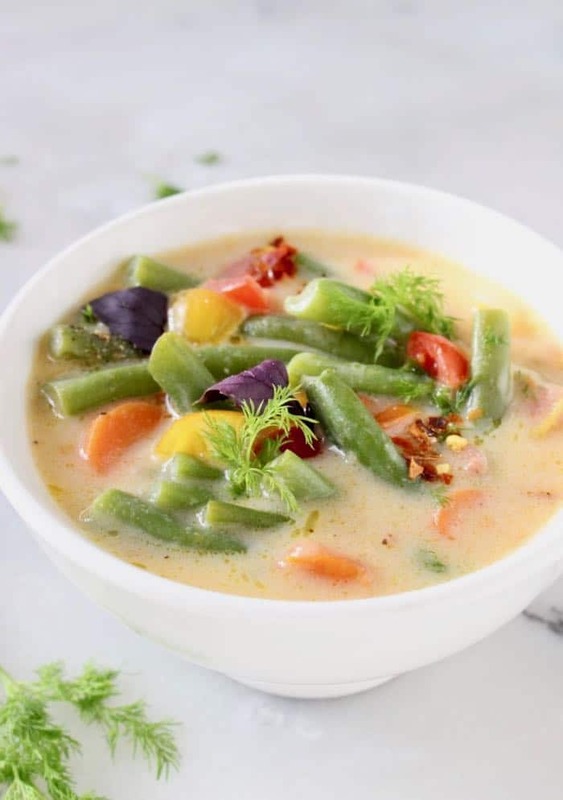 Creamy but healthy green string bean soup recipe of Romanian origin that is also plant-based, vegan and insanely delicious with tons of flavor from garlic and dill. 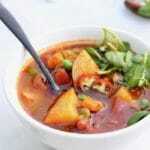 An easy, simple vegetable soup recipe I picked up from my Transylvanian grandma many moons ago. She used to make it from scratch of course, with the tender yellow wax beans variety she grew herself and a handful of fresh heirloom tomatoes from the garden. Green beans, string beans, snap beans or yellow beans, whatever you have will work here! 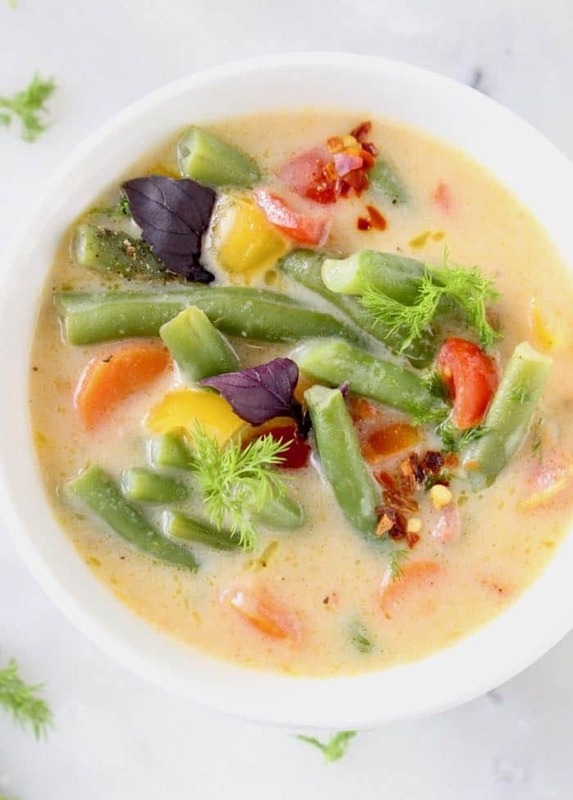 Lots of fresh dill and garlic are an absolute must for that authentic old world flavor we are after in this string bean soup. Don’t skimp on either one! In order to achieve a perfect tenderness of the beans I opted for steaming them instead of boiling, a step you can even do ahead of time and refrigerate until needed. Magical! Did you know that 1 cup of green beans contains 8 grams protein ? Plant-powered all day, every day! Let’s do this! As always, If you make this recipe remember to come back here to rate it, snap a photo and tag it with #VeggieSociety on Instagram. 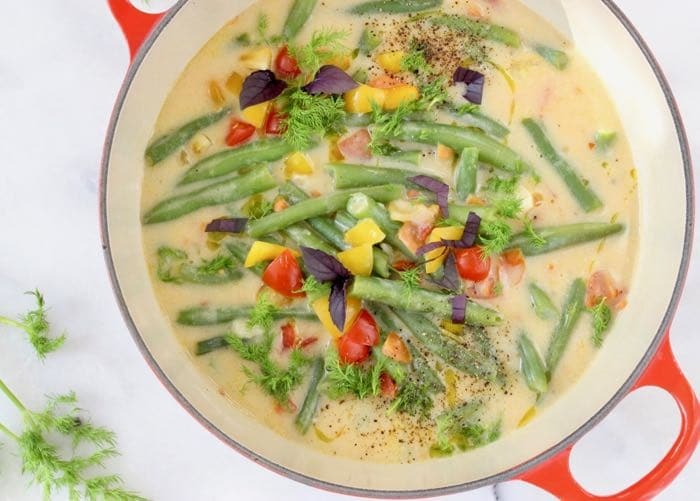 Creamy but healthy green string bean soup recipe of European origin that is also plant-based, vegan and insanely delicious with tons of flavor from garlic and dill. 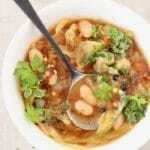 Rinse the beans, discard the ends and snap them in half or smaller pieces to your liking. Prepare a double boiler with 2 inches of water in the bottom pot. 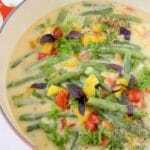 Bring to a simmer and then place the green string beans in the top basket. Cover with a lid and steam for 15 to 20 minutes until desired tenderness is achieved. Check after 10 minutes to make sure you don’t overcook the beans. Remove from the steam and transfer to a bowl. Rinse with ice cold water to stop the cooking process at this point. Refrigerate until ready to use. Carefully smash the garlic cloves with the side of a chef’s knife and discard the paper. Heat up a soup pot over medium low flame. Add a splash of water ( or a light drizzle of olive oil and sautee the garlic until golden in color and soft. Take good care not to burn it or it will turn bitter. Add more water if needed to create extra steam. Once cooked transfer the garlic to a small bowl and set aside. Add the carrots and red pepper flakes to the pot and give them a good stir. Sautee together for about 5 minutes or so until the carrots begin to soften. Whisk in the flour then pour in the plant milk and water (or vegetable stock) whisking continuously until combined. Bring to a simmer, add the bay leaves, dill sprigs and garlic and cook together for 15 minutes until slightly thickened. Stir often make sure nothing sticks. Taste the soup and season with sea salt to taste. 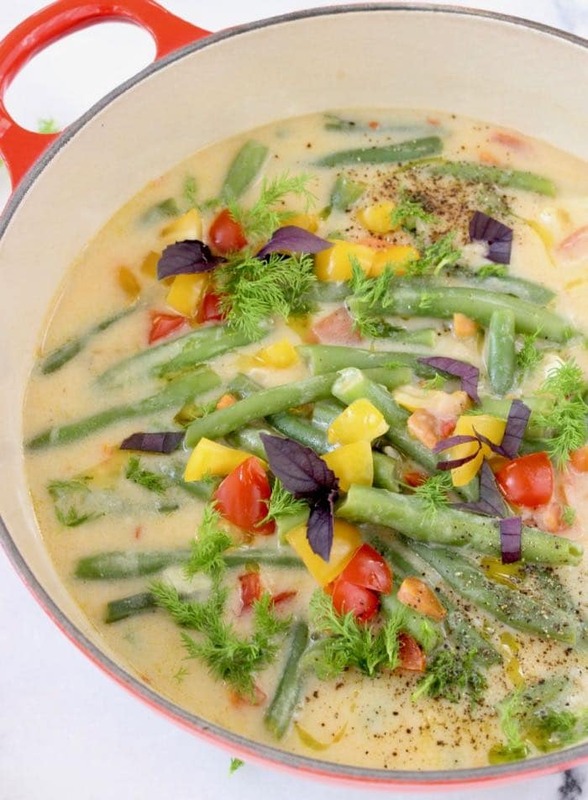 Transfer the steamed green beans to the pot and simmer a couple of minutes until warmed through. Remove from heat and discard the bay and dill sprigs. Stir in the chopped fresh tomatoes, taste and adjust seasonings again. Serve with lots of fresh dill, red pepper flakes and freshly cracked black pepper on top. Great served hot or cold on a hot day. Just a small thing please. I love your recipes but I am unable to save them on my phone and I cannot pin it. 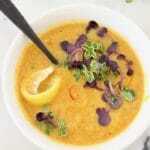 If you can be so kind as to make your recipes pinnable on Pinterest it will be much appreciated. Thank you ? He about making this in a crockpot?